Needy children will be having a happier Christmas thanks to Bury Market and Tower FM. The market was proud to sponsor and support the station's toy appeal to help youngsters who might otherwise not be receiving gifts this year. The appeal asked people to drop off toys on the market at two locations in receptacles provided by Viridor. On the last day of the collection, Jon and Vix from Tower FM's Breakfast Show boarded a vintage 1951 Leyland Tiger Vintage Coach - provided by Belle Vue Coaches Stockport - and visited businesses in Wigan, Bolton and Bury to collect even more toys and deliver them to the market. The Mayor of Bury, Councillor Sharon Briggs, was there to welcome the bus, along with Santa, and the toys will now be distributed to worthy recipients in Bury and Bolton. Bury Market Management would like to thank everybody that kindly gave presents to this worthy cause. 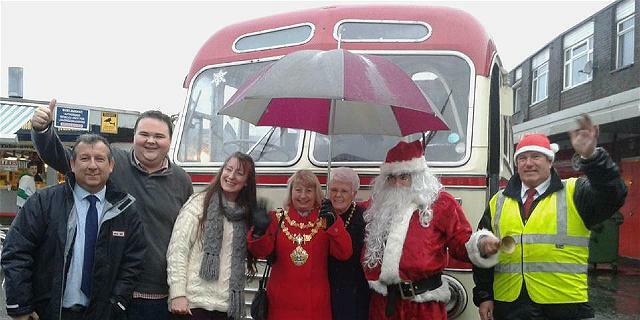 Pictured welcoming the bus at the market are the mayor, Cllr Sharon Briggs, her consort Mrs Shirley Rabbitt, Santa, Jon and Vix from Tower FM's Breakfast Show, and the drivers from Belle Vue coaches.